The rapid loss of fertile land, overfishing, increasing water scarcity, global warming, the intensification of extreme weather events and disruptive food chains are making themselves felt across the planet. At the same time, continued high population growth in developing countries, soaring unemployment and rapid urbanisation add to the nexus of formidable challenges. All these trends are interrelated and reflect a lack of focus on developing a response to the most serious set of issues affecting our world today. The situation is far from hopeless, however. Means for effective restoration of damaged ecosystems are at hand. In a new path-breaking project, IKED engages with partners in the Middle East to initiate a series of pilot studies aimed to examine and demonstrate how technical, organisational and social change can be made mutually enforcing in support of massive greening projects. The innovative Groasis Waterboxx technology produced by AquaPro in the Netherlands allows trees to take root and grow under extremely harsh conditions using minimal volumes of water. In a sense, the Groasis Waterboxx is a copy of Mother Nature which does not depend on drip irrigation from the surface. Here, native species are carefully selected so as to match local conditions in terms of soil, temperature, light, humidity, and so forth. The way the boxx works the root is fed by just enough water to keep it alive and be able to seek humidity in the deep, rather than depend on traditional irrigation by humans. The Groasis Waterboxx is not just a planting concept. Fulfilling its potential requires a "smart" approach, as has been adopted by the Organisation for Quality and Innovation Strategies (Qualies - www.qualies.com) in Oman, with support of IKED. The approach combines training, awareness campaigns in schools, and engagement of local communities in support of needed organisational change. 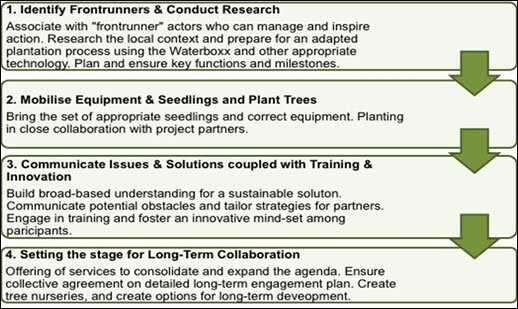 The steps illutrated below illustrate the model adopted for building and mobilising competencies to develop solutions uniquely tailored to local conditions. Despite the dramatic water savings and extraordinary results of the Waterboxx it has been difficult to fulfil the potential of this technology to date. That is all about to change with the introduction of the biodegradable Growboxx which can be produced locally and offered at a much lower price. Fulfilling the potential of greening using the Gronboxx in Oman and more widely in the Middle East and Africa represents a major opportunity for 2016 and the years beyond.